The sports that cause the most eye injuries are basketball, baseball, and racket sports, but any sport where something flies at the eye is considered hazardous. Unbreakable glasses, goggles, or face masks are required when there is a potential for eye injury. Polycarbonate lenses are unbreakable and make excellent protection for the eyes. Helmets with eye shields are recommended for football and other contact sports. Many sports, such as baseball, hockey, and men's lacrosse require a helmet with polycarbonate face mask or wire shield. Face guards can be worn over glasses, and are used primarily for football, ice hockey, and similar high-risk sports. Some sports at the national level, such as hockey, have established standards for eye protection. 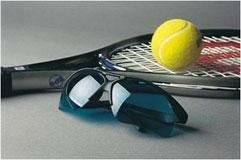 Goggles or sports glasses protect eyes while playing basketball, racquet sports, handball, and soccer. These goggles should be made of polycarbonate, which is 20 times stronger than ordinary eyeglass material. Prescription eyewear used during sports should be made from polycarbonate. For high-speed sports such as skiing, wear special frames sturdy enough to protect the eyes from any impact. Wear ultraviolet absorbing goggles or sunglasses while skiing to protect the eyes from glare, ultraviolet rays, and exposure to weather. Boxing presents a high risk for eye injury, and unfortunately, there is no adequate protection available. Contact lenses are not a form of protective eyewear. Contact lens wearers require additional protection when participating in sports. People with only one eye should carefully consider the risks of contact sports. Wearing adequate eye protection is essential for people with only one eye.